In the heights of Zansker lies the largest Drang Drung Glacier accessible to tourist in the Kargil district of Jammu and Kashmir. 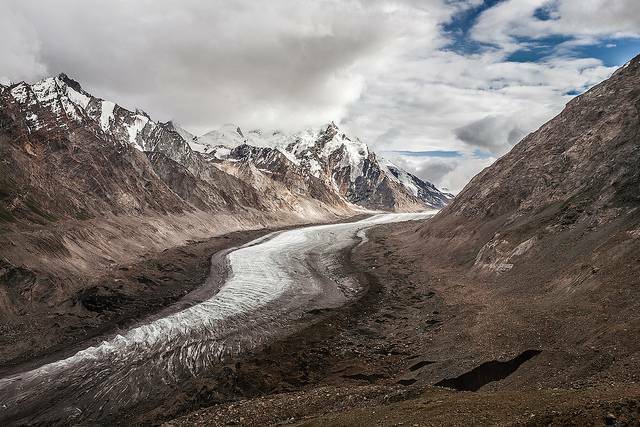 It is known for being the most picturesque place along the snowcapped mountain peaks of the Himalayas .This river of ice and snow is sure to redefine your idea of beauty. This gorgeous glacier is 331 km from the state capital Srinagar. The months from May to September let you witness this one of a kind place and experience something that is beyond your imagination. Instead of reaching this place by road one can also add up a day’s trekking experience after crossing Pensi La pass to reach this splendid place. Make sure you travel with all essentials including boots, winter clothing, medicines and some instant food to be on the safer side while being on such an exciting adventurous trip. Being here one has to go vegetarian not out choice but because that is all that is available in this place and for home stays and other facilities one has to go to Padum the administrative capital. Enjoy the least explored land in our country and enjoy the most out of it. Be among the early birds to fly to this place.